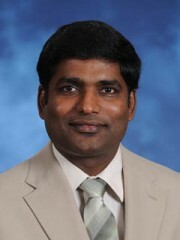 Dr. Chittiboyina’s group does a significant amount of synthetic work in collaboration with interdisciplinary researchers, including biomedical researchers. Many of these projects provide us with a unique opportunity to test the biological activity of our compounds and make modifications to improve activity or test important biological principles. Research interests from his group revolve around many aspects of natural and biologically active compounds; biogenesis of secondary metabolites; synthesis and structure activity relationships; development of non-animal alternative methods in toxicology; application of computer-aided drug design techniques for the safety and efficacy of natural products; development of new methodologies in synthetic organic chemistry; synthesis of biologically active natural products and analogues; design and synthesis of novel chemical entities for the treatment of diabetes, hypertension and malaria.